Do you want to be constantly surrounded by the fashion? Are you curious today about what’s going to be in style tomorrow? 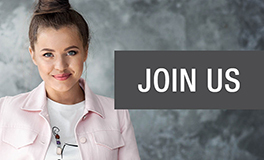 Do you want to challenge yourself and see what you can achieve in the fashion business? If so, employment at one of our stores is a great start for new opportunities. The position of sales associate is one of the most important in our stores – this employee plays a crucial role in the store’s success. This is a person who attends to customers in a professional manner, takes cares of product presentation and order in the sales area, and creates a pleasant atmosphere in the store. This job requires a high degree of responsibility, special attention to customers, and the ability to correctly allocate priorities, quickly and efficiently attend to customers, and ensure the quality of the stores operations. For those who want to grow and develop, this is an excellent place to launch a career. Our best store managers all started their careers as sales associate. The role of the sales associate – stock coordinator is a very important one in the store. Our sales depend on how fast the sales associate – stock coordinator accepts and stocks goods that arrive at the store, and how order and cleanliness in the stockroom is kept. If you are an organized person and you believe that you can ensure smooth operation of the stockroom, please contact us. Are you good at organizing work and motivating others to achieve a common goal? Are you sales-oriented and eager to achieve sales targets? Do you like dynamic work? Do you dream about a career in store management? If so, then we have a job that will help fulfil your career expectations. Employees who hold this position are trained as potential store managers, so we try to include them in all of the store’s activities. We want these employees to understand all of the proceedings that take place in the store, to analyse and manage the product, to organize store meetings, and to participate in the decision-making process together with the store manager. Manuela is working in Apranga Group for more than 7 years and during these years she achieved great results in her career through personal growth in the company. Professional and attractive presentation of goods in the store helps to create an atmosphere that reflects the brand, and to draw in customers and promote sales. This is how the latest fashion trends are presented, and the uniqueness and originality of each brand is conveyed. If you have a feel for composition, are good with colours, know how to create seamless style from individual details, have a passion for fashion and style, and are well - versed in the latest fashion trends, then you are the person we’re looking for. In the fashion business, meeting customer needs never goes out of style. Achieving sales targets, analysing the product, and motivating the sales staff to work towards goals and ensure customer satisfaction – these are the everyday tasks of the store manager. These duties are a great test of leadership skills, teamwork and personal ambitions which encourage the manager to improve and be a role model for his or her team and colleagues on a daily basis. More than 100 specialists from various fields are employed at our head office. The purchase and sales departments are responsible for ordering, presenting, and promoting the sale of the newest and most stylish products in stores. The personnel department takes care of recruitment and staff development. The marketing department, in collaboration with partners, takes care of brand image in the market as well as advertising, social communication, fashion photo shoots, display concepts and decorations. The logistics department ensures smooth operation of the supply process from the central warehouse to the store shelves. The IT, accounting and export departments ensure seamless execution of important corporate processes. The contribution of each department is critical to the company’s overall activities in pursuit of the best possible results. Inese started to work in our company as sales assistant and she step by step grew up to become HR manager. Today she successfully seeks for new talents within Apranga Group.